Did you ever notice that in almost every great war in history, France has been involved in some way? Here’s an example: Prussia's 2 wars that established Prussia as a great power and paved the way for the eventual unification of Germany. 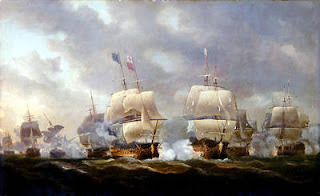 Pictured is the Battle of Quiberon Bay, November 20, 1759. This battle marked another milestone in Britain's dominance of the seas.